E12-40 – WHAT TO BUILD WITH NOW? At the request of his audience and students, and without waiting the publication of his next book (« QuCoCoMa » – E12-40), here is a graph by Philippe Samyn (used since October 2018 in his conferences and lectures) and a summary of the thoughts it might spark. Before 1914, with a few exceptions, constructions were made from earth, stone, baked earth bricks and tiles, wood, vegetal and animal fibres. Since then, in industrialised countries, Portland cement, steel, plastic, glass and aluminium gradually replaced these traditional materials. The figure illustrates alongside the growth of the population (exclusively urban since 1990) the growth of the world production in primary energy, cement, steel, wood (excluding heating) and plastic from 1945 to 2017. It also makes a few educated guesses until 2050. The speeding up of the cement production, which also occurred in the 1990s, correlates to the collapse of the USSR, the opening of China, the emergence of globalisation and the establishment of a new global economic order. The Internet too became widely accessible in the 1990s, as the World Wide Web gradually developed. Abundant energy is suddenly doubled between 1990 and 1998 by an unbelievable financial abundance, resulting straight from the value maximisation of future profits of listed companies around the globe (stock indexes go from 100 to 1,000 between 1910 and 1990, then from 1,000 to 10,000 between 1990 and 1998!). These funds are wasted in part in unbridled constructions. They are costly and fragile, wrapped in a luxury that compares to the carelessness of that time. Except in China, still in booming urbanisation, the cement production slows down and the steel production plateaus in the 2000s. In the meantime, issues related to energy resources and global warming are arising. Amazingly, the dramatic surges in the Chinese cement production in 1990 and steel production in 2000 do not happen in India, in spite of the similarity of their populations in numbers and urbanisation. 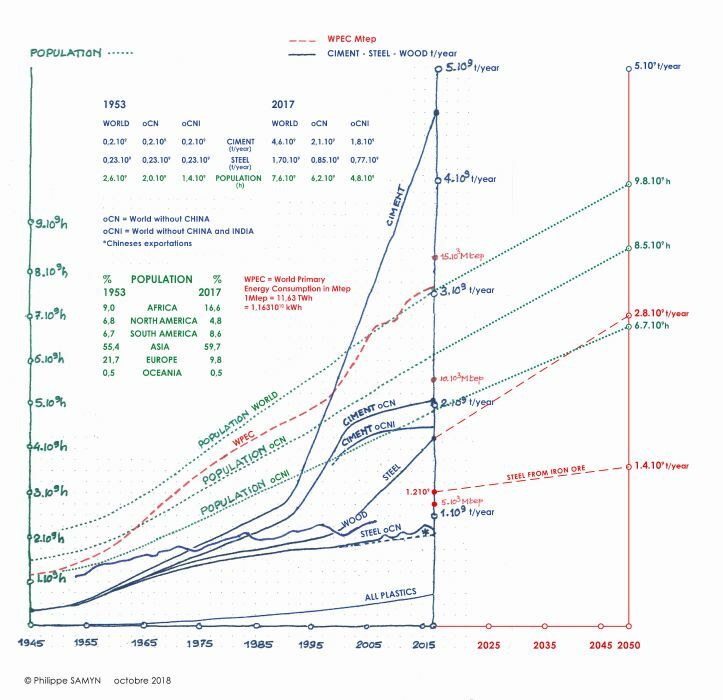 The world production of primary energy follows the growth of the world population and also soars from 2000 on, maybe in order to address the needs of the data centres? The oil crises in 1973 and 1979, before China’s opening, did not seem to impact neither these productions, nor the way of thinking about the construction. But the third oil crisis in 2008, combined with the Chinese overproduction and the general awareness of environmental issues should now deeply impact them. This statement can be freely reproduced and used, provided the source is acknowledged.